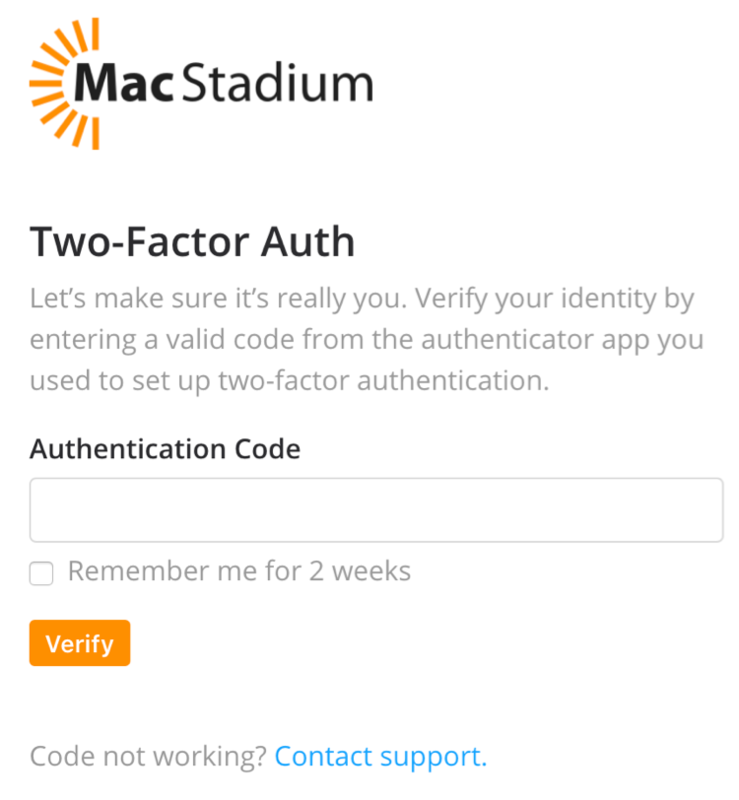 MacStadium now offers the ability for customers to enable two-factor authentication (2FA) when logging into portal.macstadium.com. Two-factor authentication will provide you with an additional layer of security when accessing your customer environment. It is available for all team members in the portal. Please note, 2FA is NOT turned on by default. 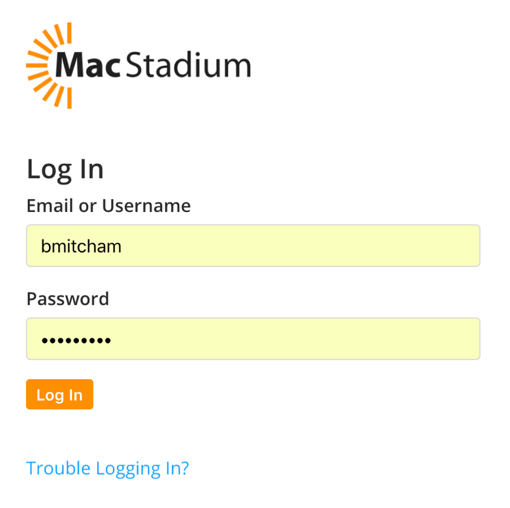 It is not required to logon to portal.macstadium.com. It can easily be turned on or off from inside your customer portal. Should you lose access to your authenticator app, you can disable 2FA by contacting MacStadium Support at 1.855.288.2260. 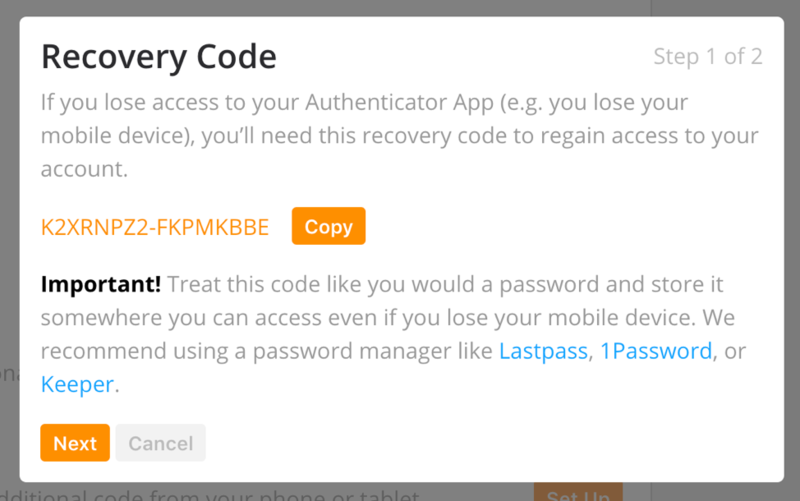 Please keep in mind that you will need the recovery code to disable two-factor authentication over the phone. 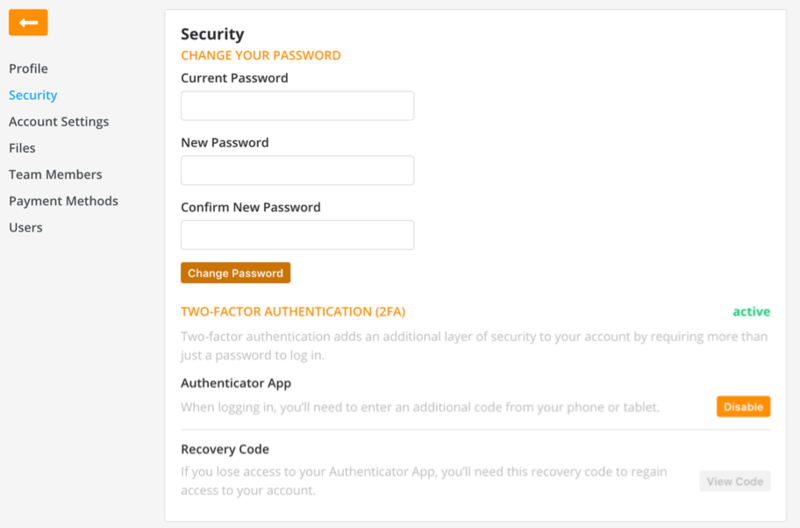 First, you will need to have an account in portal.macstadium.com to use two-factor authentication. If you do not have an account in the portal you will need to request one from an existing account administrator within your organization. For any questions about the portal you can email care@macstadium.com. 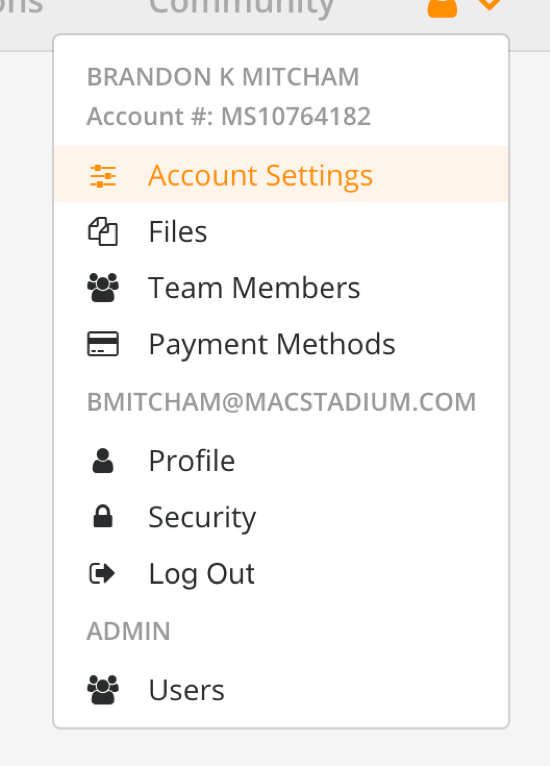 Next you will need to login to portal.macstadium.com. Once you are logged into the portal, you will need to click on the Users menu on the top right. From here, click on the Security menu option. Here begins the two-factor authentication process. To begin, you will need an authenticator application like Google Authenticator. This can be downloaded at no cost from the Apple App Store or Google Play. As you can see above, 2FA is not currently enabled. Click on the Set Up button. Displayed here is the Recovery code. 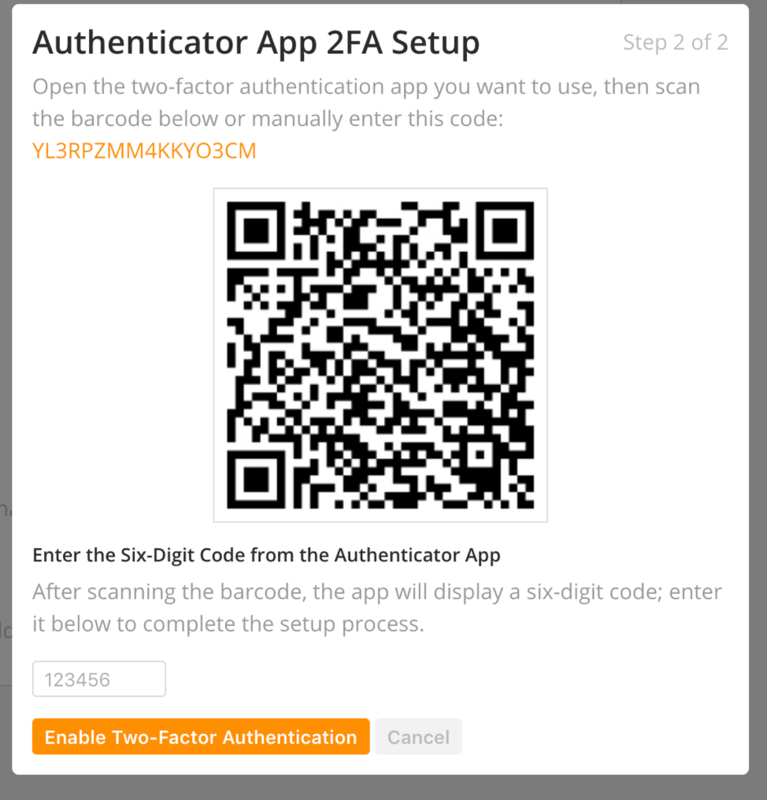 It is vital that you keep this code written down, if you lose access to your authenticator app, you will need this code to disable two-factor authentication. Once you have the code written down, click on the Next button. On this screen, you will need to open your authenticator app and scan the QR code. You will need to enter the code. Please be aware, this code changes every 30 seconds. Once you enter the code, two-factor authentication will be enabled. You will see that two-factor authentication has changed to Active in green in the Security tab in the portal. If you wish to disable 2FA, all you need to do is click the Disable button while logged into the portal. Next, you can log out of the portal. 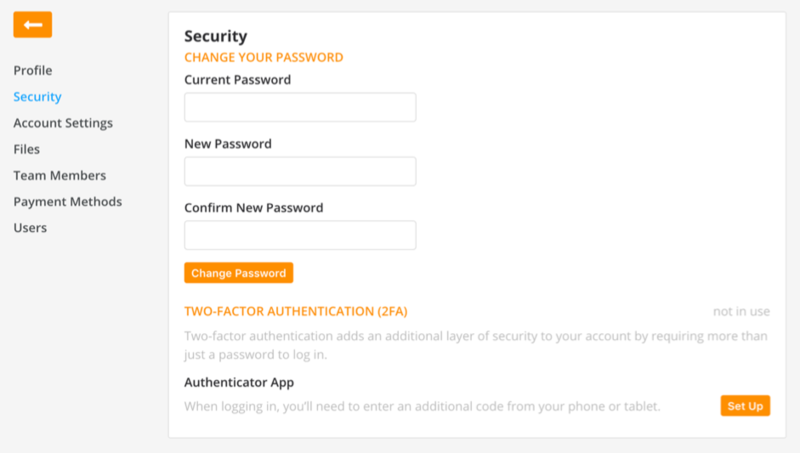 On your next login, the login screen will look different after you sign in with your username and password. Once you have authenticated, it will ask you to open your authenticator app. In your authenticator App, you will see a 6-digit code. Enter the 6-digit code to gain access. And it’s that simple! You now have secure access to your portal. However, it may be necessary for you to disable two-factor authentication and you do not have access to your phone that had the authenticator. In this case, you will need to contact MacStadium Customer Support. Just give them the code you wrote down when you enabled 2FA and they can remotely disable. Once it is turned off, you can login with your administrator username and password like you did before.